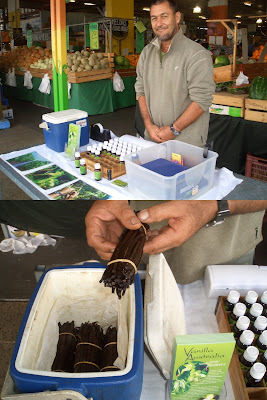 MB was pretty chuffed when she stumbled upon a stall at the Cairns' Rusty's Markets selling locally grown organic vanilla. She had quite a chinwag with the grower, Russell Spanton, who with his wife, Mary, grows the vanilla in Port Douglas and are the first commercial vanilla growers in Australia. Russell has had the vanilla tested by the CSIRO and was told it has 4 times more vanilla content than any other beans tested, including beans from Tonga, Tahiti, PNG and Madagascar. Russell also shared some of his colourful experiences with other local vanilla growers, lots of argy bargy going on. Up until encountering Vanilla Australia (vanillaaustralia@bigpond.com) at Rustys Markets MB had no idea any vanilla beans for commercial sale were even being grown in FNQ. MB did of course purchase some beans but as yet hasn't used them. She's planning to make some crème brûlée soon and will report back.